http://cookingwithamy.blogspot.com. This one is sans the cream which is I believe an authentic recipe for this classic. 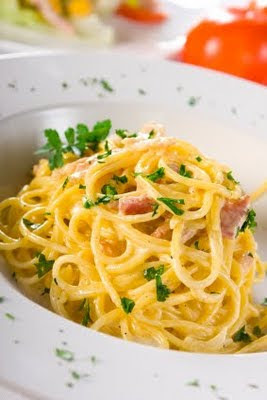 Thanks to Amy for allowing me to post the recipe and quote the history of carbonara from her blog site. "The alla carbonara in Spaghetti alla Carbonara means in the 'manner of coal miners'. There are more than a few stories as to why it is called carbonara, the three stories I've heard are because the freshly ground pepper topping the dish resembles flakes of coal, or because it was cooked on the streets of Rome over coal burning stoves or finally that the dish was popular among coal miners and so it was named after them. Spaghetti alla Carbonara is a great winter time dish. It's also one of those things you can whip up when you have almost nothing in the house. My favorite time to eat this is late at night for some reason. While I don't mind using bacon instead of guanciale or pancetta, I do draw the line at adding whipping cream. When made correctly this is a very creamy dish, and needs no cream." Bring salted water to a boil, add the pasta and cook for 8 to 10 minutes or until tender yet firm. Drain the pasta, reserving 1/2 cup of the cooking water to use in the sauce if needed to thin it out a bit. Meanwhile, heat the olive oil in a skillet over medium heat. Add the bacon, and saute until the bacon is crisp and the fat is rendered. Toss a smashed clove of garlic into the fat and saute for less than 1 minute to flavor the oil, then remove it. Beat the eggs and Parmesan together in a mixing bowl, stirring well to prevent lumps, set aside. Add the hot, drained spaghetti to the skillet and toss to coat the strands in the bacon fat. Remove the pan from the heat and pour the egg/cheese mixture into the pasta, toss the spaghetti quickly until the eggs thicken, but do not scramble (that is why you do this off the heat) Thin out the sauce with a bit of the reserved pasta water, until it reaches desired consistency. The sauce should be creamy, not "scrambled egg" crumbly if that makes sense. Season with lots of freshly ground black pepper, a sprinkle more of grated cheese and taste for salt. Serves 2 people. I shall be making this fine recipe tonight. Anyone else going to try it? Visit Amy's blog http://cookingwithamy.blogspot.com/2004/01/spaghetti-alla-carbonararecipe.html. The recipe and quote are copyright of Cooking With Amy and are reprinted here with permission. My thanks to Amy for the informatino and great recipe.